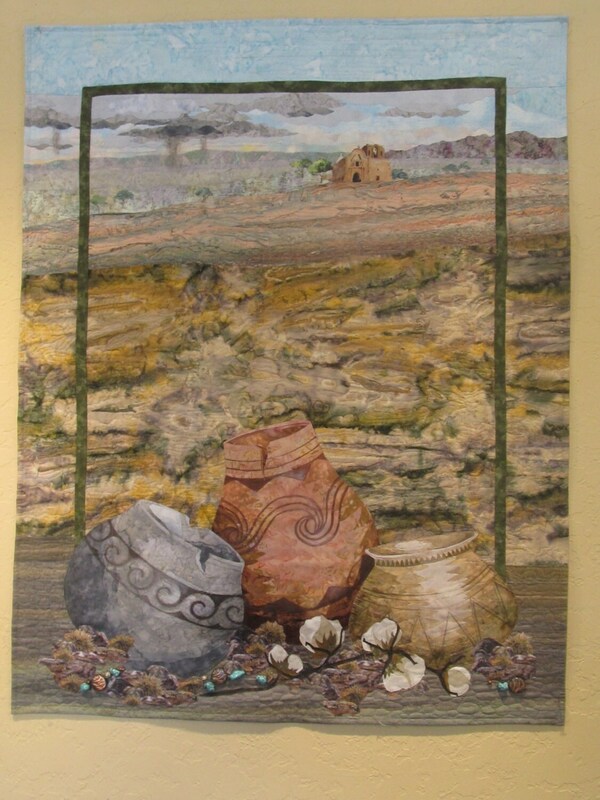 an Original appliqued landscape quilt created by this artist to honor all those who have called the Pimeria Alta their home. San Jose de Tumacacori mission stands as a testament to the earliest influence of European culture on the indigenous people of the southwest. Virga can be seen in the distance as a monsoon storm approaches the "Dove of the Desert". Realistic appliqued and hand painted pots in the foreground represent the heritage and the historical significance of today's O'Odham people. For thousands of years before the Jesuit priest, Father Kino first came to Arizona, the ancestors of the O'Odham , the Sobaipuri and the Pima, lived and farmed cotton in the Santa Cruz valley. Hand-sewn beads of faux turquiose and copper hint at the importance of trade in this region. 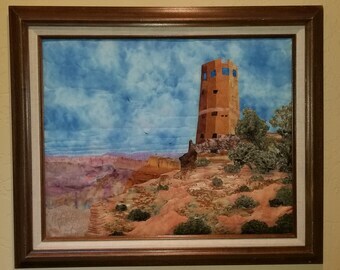 This story quilt was created from commercial and hand-dyed cotton fabrics with fusible applique, thread painting, and painting techniques. Created in a pet-free and fragrance- free studio. Ready for hanging with a hand-sewn 4 1/2 inch sleeve on back. Written appraisal available upon request. Thank you, it looks really nice with our southwest decor! 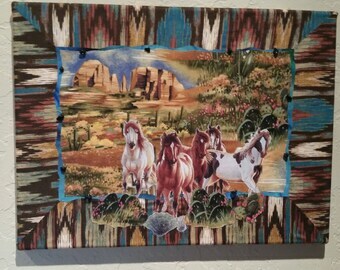 Your original art quilt can be shipped to you in three to five working days after payment is received. I will wrap it in tissue and , place it in a plastic bag, and then a padded box for extra protection. I will be more that happy to insure it's arrival to you for an additional charge.